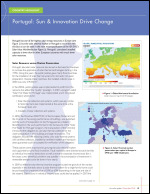 As the share of renewables in energy production grows so does the role for thermal energy storage. 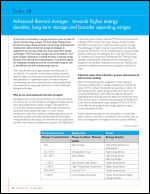 The wide range of applications for thermal energy storage presents a broad range of development conditions for advanced thermal storage technologies to supplement the existing, widely used water-based heat storage technologies. 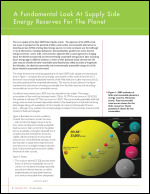 Thermal energy storage could reveal itself as a real game-changer, allowing for a notable decrease in primary energy demand, thus reducing the energy footprint. It could also support the widespread acceptance and use of renewable energy as well as the efficient use of fluctuating energy sources. The 12th EuroSun International Conference on Solar Energy for Buildings and Industry was a big success. On September 10th to 13th, more than 130 oral and 180 poster presentations were given to an audience of researchers, professionals, and experts from all over the world in Rapperswil, Switzerland. 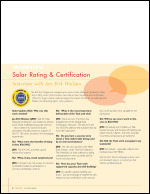 As 2018 comes to an end so does our most recent Task on Solar Standards and Certification. 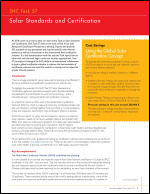 SHC Task 57 built on the work of Task 43 on Solar Rating and Certification Procedures to develop, improve and promote ISO standards on test procedures and requirements for solar thermal products as well as to harmonize at the international level certification schemes. It is this harmonization work that sets this Task apart from our other work and the work begin carried out by other organizations. 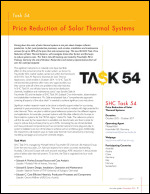 Task 57 participants leveraged the SHC platform of international collaboration to push a global certification initiative to improve the harmonization of certification schemes and avoid the need for re-testing and re-inspection of solar thermal products. By: Attia, S., Bilir, S., Safy, T., Struck, C., Loonen, R.C.G.M., & Goia, F.
Abstract - During the last decades, a great number of innovative building envelope materials and façade components have been developed. The majority of these technologies promise significant improvements in energy efficiency and occupant's comfort, with products that are easily available in the market. However, it remains a challenge to assess the performance of such facades, leading to difficulties for efficient design, operation, and maintenance. 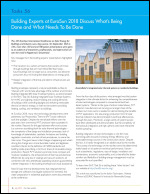 As a consequence, the market adoption of adaptive facades is not realizing its full potential, resulting in missed opportunities for energy savings and improved occupant satisfaction. 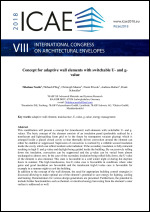 In this study, the current trends of adaptive facades are investigated, with particular emphasis on their performance assessment. Based on extensive literature review, the gaps in assessment of adaptive facades are determined and a novel object-based façade characterization and classification framework is proposed. Furthermore, a generic stakeholder map and process map are presented to explain current adaptive façade delivery practices. In addition, the findings of interviews and two focus group discussions with experts and specialists are presented to elucidate their expert opinions, leading to a validated framework of key performance indicators. 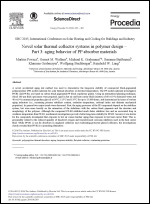 As results of this paper, the gaps related to adaptive façade systems’ assessment are identified with respect to the different actors and stakeholders, and insights and perspectives on current trends and future challenges of adaptive façade system assessment are provided. Abstract - As the interface between interior and exterior spaces, the façade plays a key role for the thermal and visual conditions in buildings. 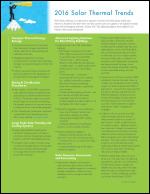 Advanced daylighting systems should fulfill various and in parts contradictory requirements: they must provide sufficient and adequately distributed natural lighting, avoid visual discomfort (glare) while allowing visual contact to the exterior, provide solar gains for heating in winter and protect from high radiation against overheating in summer. Integrating these functionalities often results in products which are more complex than conventional sunshading systems and thus are often not properly characterized and cannot be applied in standard design workflows. We present approaches for the characterization of advanced daylighting systems and introduce DALEC, a simplified tool for combined lighting and thermal simulations that can account for such systems. A comparison between DALEC and TRNSYS proves that the simplified approach is adequate for integrated simulations in early design phases. 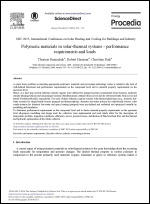 A new approach of highly-efficient thermal refurbishments of multi-family buildings is presented that has a high potential to reduce costs and simplify the renovation processes significantly. This approach is based on prefabricated curtain wall elements that integrate components for the energy supply system such as heat pumps, PV panels and all the necessary pipework for supply and waste water lines. By using pre-fabricated curtain wall elements, scaffolding and the relocation of inhabitants can be avoided. 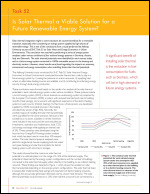 Three different system concepts have been evaluated and compared to a reference retrofit in terms of primary energy and life cycle costs. It has been shown that the new concepts can reduce the primary energy consumption significantly while reducing the costs over the lifetime of the system. Finally, a functional mockup of such as pre-fabricated façade was constructed and successfully tested in the laboratory. As the interface between interior and exterior spaces, the façade plays a key role for the thermal and visual conditions in buildings. Advanced daylighting systems should fulfill various and in parts contradictory requirements: they must provide sufficient and adequately distributed natural lighting, avoid visual discomfort (glare) while allowing visual contact to the exterior, provide solar gains for heating in winter and protect from high radiation against overheating in summer. Integrating these functionalities often results in products which are more complex than conventional sunshading systems and thus are often not properly characterized and cannot be applied in standard design workflows. We present approaches for the characterization of advanced daylighting systems and introduce DALEC, a simplified tool for combined lighting and thermal simulations that can account for such systems. A comparison between DALEC and TRNSYS proves that the simplified approach is adequate for integrated simulations in early design phases. 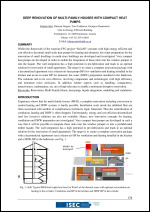 Within the framework of the Austrian FFG project “SaLüH!” concepts with high energy efficient and cost-effective decentral small scale heat pumps for heating and domestic hot water preparation for the renovation of small dwellings in multi-story buildings are developed and investigated. Very compact heat pumps are developed in order to enable the integration of these units into the window parapet or into the façade. The wall integration has a high potential in pre-fabrication and leads to an optimal solution for renovation of small apartments. The target is to create a complete renovation package with a decentralized (apartment size) exhaust-air heat pump (HP) for ventilation and heating installed in the kitchen and an air-to-water HP for domestic hot water (DHW) preparation installed in the bathroom. The solutions aim to be cost effective, involving components and technologies with high efficiency and minimum noise emissions. In addition, further aspects such as handling, compactness, attractiveness, maintenance, etc. 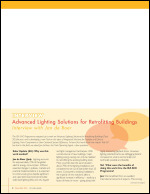 are of high relevance to enable a minimum disruptive renovation. 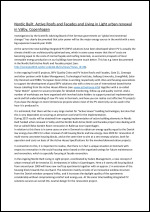 Abstract - To reach future Net-Zero Energy Buildings as requested by the “Energy Performance of Buildings Directive” (EPBD, ) the integration of systems for harvesting of renewable energy is decisive. 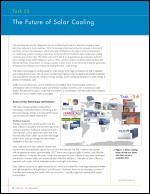 Building integrated solar thermal (BIST) collectors can play an important role in this paradigm shift. In the R&D projects ArKol and TABSOLAR multidisciplinary teams develop different BIST systems for transparent and opaque facades. These solutions help trigger highly qualitative architectural integration of solar thermal collectors and are planned for future realization. 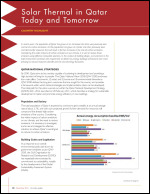 This paper describes the basic layout of these systems and the current state of development. 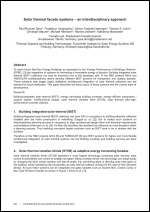 Keywords: Building-integrated solar thermal (BIST), energy harvesting building envelope, energy-efficient transparent/ opaque façade, multifunctional façade, solar thermal venetian blind (STVB), solar thermal ultra-highperformance concrete collector. This contribution will present a concept for (translucent) wall elements with switchable U- and g-values. The basic concept of the element consists of an insulation panel (preferably realized by a translucent and light-guiding foam grid or in the future by transparent vacuum glazing) which is arranged inside a glazed closed cavity so that thermally driven convection around the element can either be enabled or suppressed. Supression of convection is realized by a rollable second insulation inside the cavity which can reflect incident solar radiation: If the secondary insulation is fully retracted resulting in high U and g-value and daylight being guided inside the building. By successively rolling down the insulation, convection can be suppressed and the g-value can be varied from almost unchanged to almost zero. In the case of the secondary insulation being rolled fully down, the U-value of the element is also minimal. This state is favourable in a cold winter night or during hot daytime hours in summer. 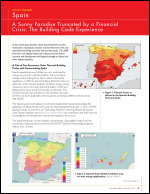 The high translucence, low-U-value case is favourable in conditions where solar gains and good insulation are favourable and the translucent high-U-value case is favourable for example in a summer night to cool the building (...). There is a growing demand for curtain walls within the European Union, coming mainly from the commercial sector and especially targeted to office buildings. Despite recent efforts on heat loss mitigation (relying on additional glass panes, coatings or thermal breaks to framing elements) curtain walls remain a significant contributor to the energy consumption of such buildings. 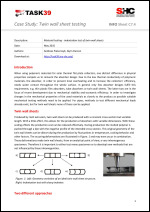 This paper presents the design and development of an energy-efficient alternative to conventional curtain wall systems, achieving equivalent transparency and aesthetics with greater comfort and reduced energy consumption. An integrated air cavity, sandwiched between glazing layers of thoroughly selected properties, harvests heat from both incident solar radiation and transmission losses recovered from the indoor environment. The system can supply the airflow required for ventilation with preheated fresh air, thereby reducing energy consumption in the heating season, and even delivering net gains in favourable conditions. 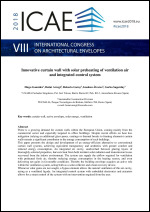 Thereby the building envelope acquires an active role within the ventilation system, acting both as a solar collector and a heat recovery device. Whenever solar gains are not sought, a bypass element allows the natural ventilation of this air cavity, acting as a ventilated façade. An integrated control system with embedded electronics and actuators allows for a smart control of the system with no intervention required from the user. 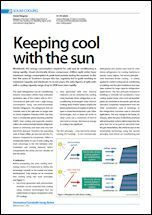 In this article it is presented an innovative façade system with a solar thermal system. The developed solar system can be classified as modular unglazed collector, designed for low temperature energy capture. It is compatible with a solar combined system that integrates a solar heat pump. The external appearance of the building remains untouched thanks to this innovative system. Experimental works at façade collector level are presented. The integration of the unglazed collector in a heat pump based combined solar system, its performance levels and economic figures are presented. By: Saini, H., Loonen, R.C.G.M., Hensen, J.L.M. 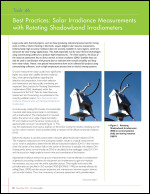 Abstract: Shading devices are effective in controlling glare and solar heat gains in buildings. However, this occurs at the expense of daylight and outside view. 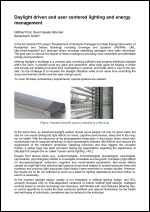 This paper evaluates the thermal and daylight performance of Lumiduct, a sun-controlling dynamic façade system that permits only diffuse radiation inside the building, while producing electricity. This imparts Lumiduct a unique characteristic of acting as a shading device while providing useful daylight and view to the outside. The first part of the paper briefly illustrates the working principle of Lumiduct and its functional characteristics and then, introduces the basic principles of the modelling and simulation strategy used to predict its performance. To demonstrate this strategy we use TypeDLT, a TRNSYS type that performs integrated thermal and daylight simulations by coupling TRNSYS’ multi-zone building model with Radiance’s three-phase method. This strategy relies on the use of customized and time-controlled bidirectional scattering distribution functions (BSDF) to characterize the separate treatment of direct and diffuse radiation and the sun-tracking behaviour of the façade. In the second part, we demonstrate the performance of Lumiduct in comparison to a high-performance window with and without a dynamic venetian blind system as a shading device for a typical office room for the climate of Amsterdam. 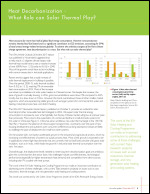 The results show a significantly higher daylight utilization along with a reduction in glare and energy use for heating and cooling the building. Abstract - Im Rahmen des von 2014 bis 2017 laufenden Projektes „Vorgefertigte Fassadenelemente mit maximal integrierten HVAC-Komponenten und -systemen zur Bestandssanierung“ wurden neue Lösungsansätze für intelligente Bestandssanierung aufgezeigt bzw. 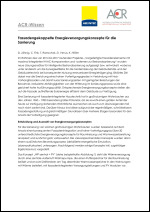 entwickelt, wobei es unter anderem um die Synergieeffekte für die Modernisierung der Gebäudehülle und der Gebäudetechnik bei konsequenter Nutzung erneuerbarer Energieträger ging. Erklärtes Ziel dabei war die Erreichung eines hohen Vorfertigungsgrades in Verbindung mit Holz- Vorhangfassaden und damit kurze Sanierungszeiten mit geringsten Belastungen der Bewohner, reduzierte Abhängigkeiten von der Witterung im Sanierungsprozess sowie eine gesichert hohe Ausführungsqualität. Entsprechende Energieversorgungskonzepte stellen die auf die Fassade auftreffende Solarenergie effizient dem Gebäude zur Verfügung. 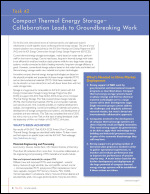 Industry and researchers are collaborating to assess how best to integrate large scale solar thermal installations in combination with hybrid technologies into district heating and cooling networks. 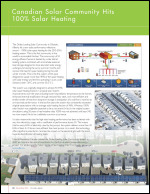 Besides the international scope of this work, what also makes it unique is that the IEA SHC Programme has teamed up with the IEA District Heating and Cooling Programme to ensure that the right stakeholders are involved. 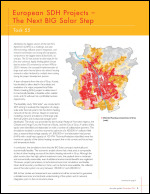 The IEA SHC Programme is finishing its work on Solar Energy in Urban Planning (Task 51). 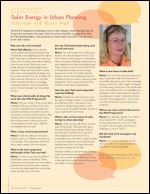 To learn first hand about the impact Task 51 has had in this field, we asked Maria Wall, the Task Operating Agent, a few questions as a teaser before next year’s wrap-up article on the Task’s results. By: Lemarchand, P., McLean, E., Norton, B. 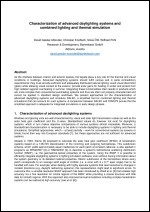 The IEA SHC Programme wrapped up its work on Advanced Lighting Solutions for Retrofitting Buildings (Task 50) this year, and is developing a new Task on the topic of Integrated Solutions for Daylight and Electric Lighting: From Component to User Centered System Efficiency. To learn first hand about the impact Task 50 has had in this field, we asked Jan de Boer, the Task Operating Agent, a few questions. 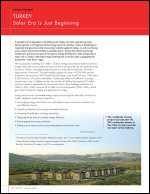 A team of experts from the city of Graz, Austria, has decided to take a lead in the analysis and evaluation of a major proposed local Solar District Heating (SDH) project to determine if it is technically feasible, is feasible within realistic costs, and if it will even be a profitable business opportunity. 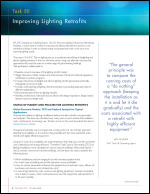 The recent IEA SHC Task on lighting set out to accelerate retrofitting of daylighting and electric lighting solutions in the non-domestic sector using cost effective, best practice approaches that could be used on a wide range of typical existing buildings. 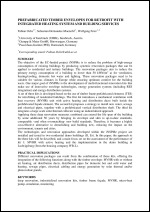 In the EC-funded FP7-project ‘Development of Systemic Packages for Deep Energy Renovation of Residential and Tertiary Buildings including Envelope and Systems’ (iNSPiRe; URL: http://www.inspirefp7.eu/) amongst others envelope retrofitting packages have been developed. The goal was to improve the façade of these buildings by providing more accessible and affordable energy saving solutions. Until very recently, technical systems such as solar thermal systems, and other HVAC elements have been conceptualized based uniquely in their thermal performance levels, and its integration with other architectural elements (envelopes, slabs,…) limited to mechanical fixation. However, with steadily increasing use of technologies for the reduction of the non-renewable energy needs in buildings, already developed in the last decades, deeper architectural integration is needed, also considering on cost and assembly process optimization to ensure wide market adoption. 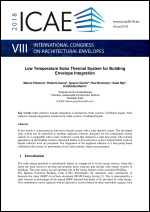 In this context, two main trends appear: Integration and hybridation of solar systems in building envelopes. Integrated solutions are created when modular and dimensionally variable glazed collectors are integrated in curtain wall structures or in external cladding systems. Hybrid solutions such as External thermal insulation systems and sandwich panels are generated where unglazed collectors are integrated as part of renders, claddings, etc. to obtain neutral aesthetical impact. Architectural, constructional and thermal results are discussed, not only based on design assessments, but also on manufacture, assembly and assessment results from experimental data. In the on-going Nordic Built Living in Light project, coordinated by Kuben Management, a new concept of urban renewal will be tested at Gl. Jernbanevej in Valby in Copenhagen. Here a 4 storey old housing block from around year 1900 will have new roof top apartments together with an approx. 2 m extension of the housing block towards the courtyard. The extension mainly consists of an innovative window structure from the Danish window company Velfac, and it increases the daylight quality of the apartments considerably without compromising comfort and energy use. At the same time building integrated PV solutions secures an overall CO2 neutral design for the renovation project. 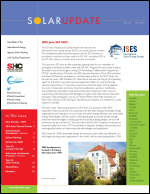 The IEA SHC Programme wrapped up its work on Solar Rating & Certification (Task 43) in 2015, and in 2016 started a new Task on Solar Standards and Certification (Task 57). 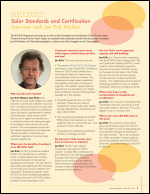 To get a better understanding of the impact of Task 43, we asked Jan Erik Nielsen, the Operating Agent, a few questions. Solar Update (SU): Why was this project needed? 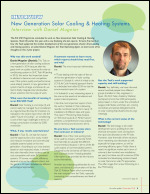 Christoph Brunner (CB): SHC Task 49/SolarPACES Annes IV: Solar Heat Integration in Industrial Processes was initiated to foster market penetration of this rather young technology that has large worldwide potential. A novel, accelerated aging test method was used to characterize the long-term stability of commercial black-pigmented polypropylene (PP) model materials for solar thermal absorbers at elevated temperatures. The PP model materials investigated, PP-B1 and PP-B2, are based on carbon black pigmented PP block copolymer grades. Using an automatized planning technique, sliced 100 µm thick specimens were prepared, aged in hot air and heat carrier fluid (mixture of 60 vol.-% deionized water and 40 vol.-% commercial propylene glycol) at 95°C, 115°C and 135°C for up to 15,000 hours, and characterized in terms of various aging indicators (i.e., remaining primary stabilizer content, oxidation temperature, carbonyl index and ultimate mechanical properties). 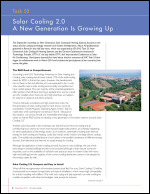 In general two major trends were discerned. First, the aging processes of the PP compounds depend on the stabilizer system, but even more heavily on the interaction of the stabilizers with the carbon black pigments and the structure and morphology of the polymer. Although the compound PP-B2 exhibited much faster stabilizer loss and an associated drop in oxidation temperature than PP-B1, mechanical investigations proved a better long-term stability for PP-B2. Second, it was shown for the compounds investigated that exposure to hot air causes harsher aging than exposure to hot heat carrier fluid. This is, presumably related to the reduced quantity of dissolved oxygen and triazole-based corrosion inhibitors used in the heat carrier fluid. While PP-B1 is use for absorbers in unglazed collectors and overheating-protected glazed collectors, the investigations clearly revealed that PP-B2 is a promising alternative. A novel aging test method considering the superimposed mechanical and environmental (temperature and environmental medium) loads representative for pressurized integrated storage collectors (ICS) is described. Engineering polyamide (PA) grades with short glass fiber (GF) reinforcement, which are of high relevance for endcaps of steel-pipe ICS absorbers or all-polymeric absorber/storage-tanks, are characterized on a specimen level. Therefore, specific test devices and test arrangements for fracture mechanics specimens with or without weld-line are implemented on an electro-dynamic test machine. Fatigue crack growth kinetics data are obtained by conducting cyclic mechanical loads under various environmental testing conditions. The experimental results of two glass-fiber reinforced PA grades, using compact type specimens, performed at two different temperatures (23 °C and 80 °C) and in two environmental media (air and water), are compared in terms of crack growth kinetics. Moreover, the influence of welding on the crack growth kinetics for one PA grade is shown. For all specimens (unwelded and welded) the fatigue crack growth rates are enhanced in water compared to air. In welded specimens the fatigue crack growth resistance is significantly reduced compared to unwelded specimens. A major basic problem in selecting appropriate polymeric materials and processing technology routes is related to the lack of well-defined functional and performance requirements on the component level and to material property requirements on the specimen level. Hence, in a first step several reference climate regions were defined for pumped systems (continental (Graz/Austria), moderate climate (Beijing/China)) and non-pumped systems (Mediterranean (Athens/Greece), hot and dry (Pretoria/South Africa), hot and humid (Fortaleza/Brazil)), respectively. 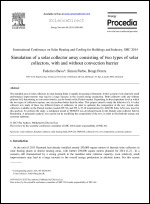 For each of these reference regions various solar-thermal plant types (e.g., domestic hotwater systems for single family houses (pumped and thermosiphon); domestic hot-water systems for multi-family houses; solar combi-systems for domestic hot-water and space heating (pumped) were pre-defined and evaluated and optimized virtually by modelling and simulation. 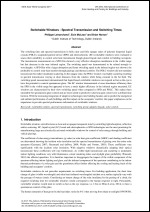 To determine performance requirements on the component level and to derive material property requirements on the specimen level all-purpose modelling and design tools for collectors were implemented and used which allow for the description of temperature profiles, stagnation conditions, efficiency curves, pressure losses, distribution of fluid and heat flow and the thermal and hydraulic optimisation of the whole collector. For the utilization of polymeric materials in high-demanding applications like solar thermal systems it is of utmost importance to define the performance requirements and to investigate the applicability of components for defined systems under service relevant conditions. This paper deals with the lifetime estimation of black-pigmented polypropylene (PP) absorber grades for overheating protected solar thermal collector systems for hot water preparation in five representative climate zones. 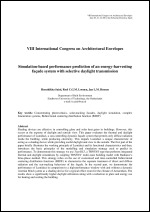 Based on experimental aging data in hot air and heat carrier fluid at elevated temperatures (95 °C, 115 °C and 135 °C) and climatic input data, as well as deduced loading conditions and absorber temperature distributions, the lifetime was calculated using a theoretical and an empirical extrapolation approach and assuming cumulating damages in service relevant temperature intervals. Depending on the PP grade, the extrapolation method and the location, endurance limits ranging from 8 to 50 years were obtained. 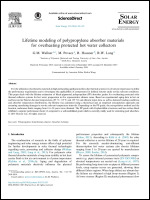 The PP grade with ß-spherulithic structures and less carbon black exhibited a superior performance (factor 2) compared to a well-established grade which is currently widely used for swimming pool absorbers. 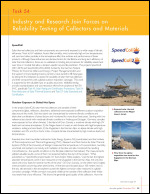 When using polymeric materials for solar thermal flat plate collectors, one distinct difference in physical properties compels us to reinvent the absorber design. Due to the low thermal conductivity of polymeric materials, the absorber, in order to prevent local overheating and to increase the collectors’ efficiency, needs water contact throughout the whole surface. 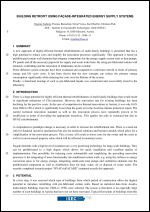 In general only few absorber designs fulfill this requirement, e.g. thin plastic film absorbers, tube absorbers or twin wall sheets. The latter two are in the focus of recent development due to mechanical stability and economic efficiency. In order to investigate changes in the mechanical properties of the used materials as closely to the product as possible suitable mechanical testing methods need to be applied. For pipes, methods to test different mechanical loads already exist, but for twin wall sheets none of these can be applied. 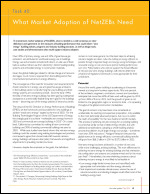 To mainstream market adoption of NetZEBs, what is needed is a wide consensus on clear definitions and agreement on the measures of building performance that could inform “zero energy” building policies, programs and industry building practices, as well as design tools, case studies and demonstrations that would support industry adoption. 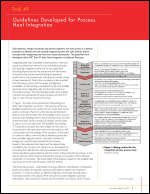 Solar planners, energy consultants and process engineers now have access to a general procedure to identify and rank suitable integration points and solar thermal system concepts when integrating solar heat into industrial processes. 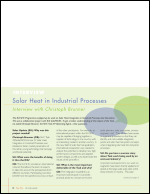 The guidelines were developed within SHC Task 49: Solar Heat Integration in Industrial Processes. 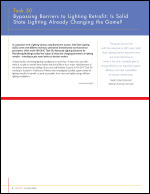 Task 50: Bypassing Barriers to Lighting Retrofit: Is Solid State Lighting Already Changing the Game? In comparison with a lighting solution using fluorescent sources, Solid State Lighting (LED) comes with different technical, operational (maintenance) and economical parameters. 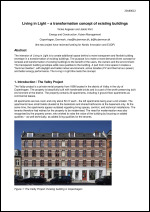 Work within IEA SHC Task 50: Advanced Lighting Solutions for Retrofitting Buildings studied the impact of these fast changing parameters on lighting retrofits – intending to give sound advice to decision makers. 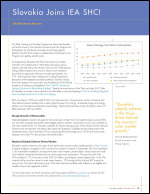 A 50 - 90% reduction in heat consumption and a 50 - 70% reduction in overall energy demand are possible when renovating a building. Twenty exemplary renovation projects highlighted in SHC Task 47: Solar Renovation of Nonresidential demonstrate how this can be achieved. Two buildings of these buildings achieved the plus-energy standard and one of them received the highest possible BREEAM score of “Outstanding.” And, all these buildings used commercially available products and systems. HVAC&R systems are the most energy consuming building services, representing approximately half of the final energy use in the building sector. Despite their significant energy use, there is a lack of a consistent and homogeneous framework to efficiently guide research, mainly due to the complexity and variety of HVAC&R systems, but also to insufficient rigor in their energy analysis. Quantifying the energy consumption characteristics of HVAC&R system is complicated, because the energy savings provided by this system depend on various factors. 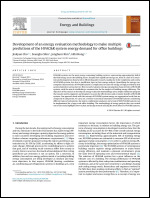 This research evaluates energy consumption characteristics of HVAC&R systems, with the aim of establishing a common idea for the analysis of building energy efficiency. The objective of this study is to develop an energy evaluation methodology and a simple simulation program that may be used by engineers and designers to assess the effectiveness and economic benefits of HVAC&R systems. 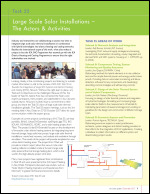 Our approach deals with the concept of HVAC&R system energy use aggregation levels that are composed of subsystems. To carry out a techno-economical estimation of HVAC&R systems considering different types of subsystems, the matrix combination analyzed, and a total of 960 HVAC&R systems can be implemented for a large-scale office building. 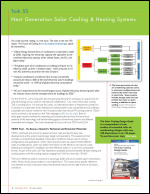 The methodology of energy analysis that was carried out in this study highlights how to plan and design toward utilizing the most effective HVAC&R systems. 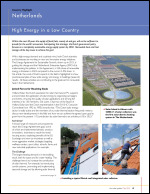 The installed area of solar collectors in solar heating fields is rapidly increasing in Denmark. In this scenario even relatively small performance improvements may lead to a large increase in the overall energy production. Both collectors with and without polymer foil, functioning as convection barrier, can be found on the Danish market. Depending on the temperature level at which the two types of collectors operate, one can perform better than the other. This project aimed to study the behavior of a 14 solar collector row made of these two different kinds of collectors, in order to optimize the composition of the row. Actual solar collectors available on the Danish market (models HT-SA and HT-A 35-10 manufactured by ARCON Solar A/S) were used for this analysis. To perform the study, a simulation model in TRNSYS was developed based on the Danish solar collector field in Braedstrup. A parametric analysis was carried out by modifying the composition of the row, in order to find both the energy and economy optimum. © 2015 The Authors. Published by Elsevier Ltd. Peer-review by the scientific conference committee of SHC 2014 under responsibility of PSE AG. Starting from the end of 2020, all new buildings will have to be Nearly Zero Energy Buildings (Nearly ZEBs—ED 2010/31/EU recast). This new ‘energy paradigm’ might be a revolution for architecture and for Photovoltaics (PV) too, but there are both cultural and technical obstacles to overcome. There is a need to re-think the way buildings are designed (integrating renewables for being ZE). 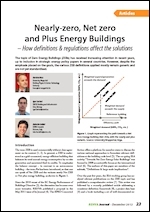 There is a need to re-think the way PV is designed in buildings. PV will be gaining an increasing relevance in the ZEBs design, thanks to its features and potentialities (suitability for any kind of energy demand of the building, easiness of building integration, cost). In a ZEB scenario, PV is very suitable for generating energy, ‘on site’ and ‘at site’; this enlarges the perspective of use of PV from the architectural scale to a wider scale, including the space close to the building or even to the urban and landscape scale. In such a new context, the existing research on the relationships between PV and architecture, focusing mainly on the way the PV components are used in relation to the envelope (Building-integrated PV/Building-added (Attached) PV), is no longer sufficient. 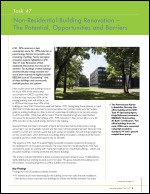 The authors envision possible formal results, opportunities and challenges, for the use of PV in ZEBs, as well as new research issues for the future relationships between PV and ZEBs from the architecture and landscape design point of view. 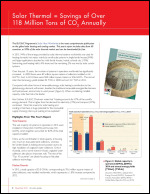 Copyright © 2012 John Wiley & Sons, Ltd.